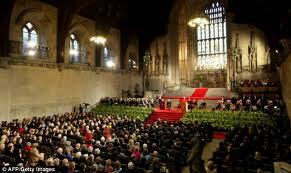 Built in 1097, Westminster Hall is a focal point of British democracy and law. Many famous Heads of State and eminent politicians have addressed both Houses of Parliament but it is quite rare for the address to be at Westminster Hall: Albert Lebrun (1939), HM King George VI in 1950, President de Gaulle (1960), HM Queen Elizabeth II (1977, 1988, 1995 and 2002), Nelson Mandela (President of S. Africa in 1996) and His Holiness Pope Benedict XVI (2010). Over the centuries, Westminster Hall has been a place where the principal English Law Courts sat until the modern High Court was formed by the Judicature Acts 1873-75. The Hall has witnessed many trials including those of Sir Thomas More and King Charles I. Interestingly, eleven years after the trials of Charles I, the "Regicides" were tried and nine were subsequently executed. The Hall was also the place where "Impeachments" took place such as that of Warren Hastings (Governor General of India). His trial took some 8 years and he was eventually acquitted. Impeachment may be obsolete but has not been legally abolished. It is interesting that it was considered by some to be a possibility in 2004 in connection with Prime Minister Blair. The other notable use of the Hall has been for "Lying in State" usually of a Monarch. The last occasion was in 2002 - Her Majesty Queen Elizabeth the Queen Mother and, prior to that, Winston Churchill in 1965. It was said that over 200,000 people filed past the coffin of the Queen Mother. The fascinating history of this splendid building may be seen on the Parliament website - (Westminster Hall). See also Pictures from Old Books. It's a NO to AV .... but .... what lies ahead?